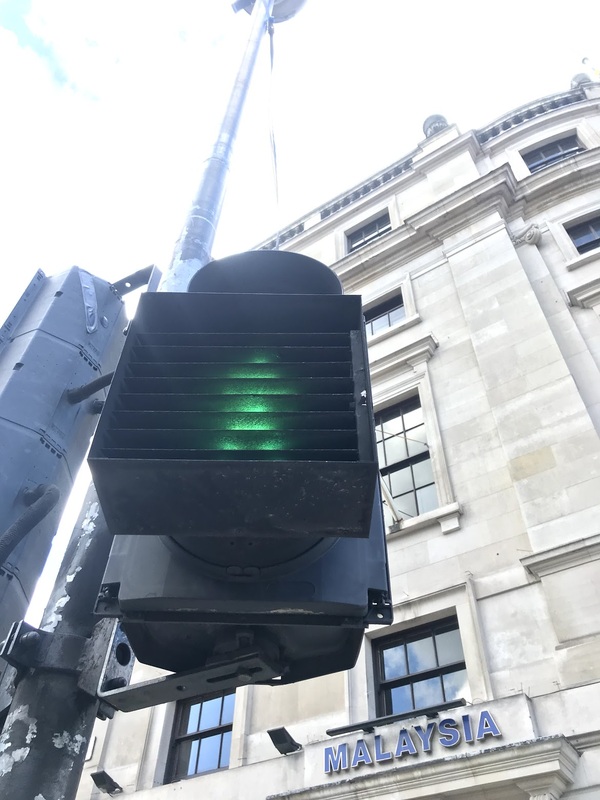 I recently visited London and noticed some pedestrian traffic lights are covered weirdly so they're only visible from some angles. Looking it up in a search here didn't bring up any results. Does anyone know why they're going through the trouble to do this? We use these in the USA and that is the only place I have noticed them. There are at least 2 general "shade" types, "visors" and "louvers". Visors: Horizontal "shades" like the ones you posted are most likely to block the sun overpowering the light as this intersection probably faces roughly East/West. They also come in a few other shapes/forms. Louvers: Louvers take many shapes but the most obvious is a vertical sort of "shade" like so. A Louver's purpose is to restrict the viewing angle of the signal. It is also worth mentioning that some visor designs work well for the same purpose as Louvers, however Louvers don't generally do a very good job as Visors. Due to road layout and light configurations, sometimes it is only safe to cross half of the road (up to the safety island). The shades ensure that you do not mistake the green light on the island as the signal to cross the entire road - you can only be sure that it is a green light (but not a broken light, which the general highway code on crossing a uncontrolled crossing kicks in) once you are on the island. 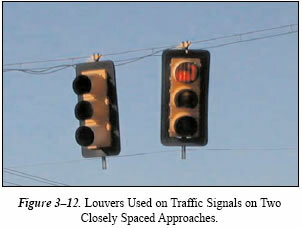 Similar shades are installed on traffic lights for vehicles to reduce the risk of drivers running into an intersection thinking it is a green, when the light meant for the driver is showing red. I do not have a written source to back up what I said above, though I was told this by my driving instructor when I learnt to drive in London a few years ago. These type of shades are not restricted to pedestrian traffic lights. They are widely used in the UK when there are many lights controlling different streams of traffic around a junction. Their purpose is to ensure that drivers (and pedestrians) can only see the lights that are relevant to them and avoid problems like traffic starting to move when another lane of traffic gets a green light. The shutters are not always "horizontal" as in the OP's photograph. They may be "vertical," to prevent you seeing a light positioned to the side of the light that is relevant for you. Not the answer you're looking for? Browse other questions tagged uk london or ask your own question. London urban transport, all-inclusive (incl some airport) one week?